It is a cliché in Business Intelligence domain – Garbage in, Garbage out. Everyone understands the need and importance of data quality (DQ) but unfortunately, today DQ seems to instill very little confidence into data and the reports, built on this data. Primary reason for lack of confidence is, DQ is done in silos and DQ does not validate bigger business rules. Today, DQ is mostly structural analysis (like null validation, range validation, format validation, deDup, geo-encoding etc.) which is done during data storage phase (when the data is stored in RDBMS). This paper proposes a data life-cycle model, like TOGAF (The Open Group Architecture Framework) proposes an architectural life-cycle and how DQ should be integrated along the multiple phase of data life-cycle. As the requirement management is very critical for enterprise life-cycle, data quality is the center of data life-cycle. Inconsistent data in any phase of data life-cycle is bad for business. Like TOGAF this paper also proposes the input artifacts, output artifacts, steps to be taken within any data life-cycle phase. As TOFAG tries to standardize the enterprise architecture process, this paper proposes a model to standardize data life-cycle. DQ, long has been pain point of business. It is not uncommon for an organization to spend time and resources to build operational and historical reports, only to find out the underlying data is not correct. Then, they spend more time and resources to figure out what went wrong and why the data was not correct. Invariably, the findings will tell, there was a new business rule or change in business rule, which the DQ did not capture. As the business is dynamic, business rules are bound to change. DQ that validate the business rules are reactive and not proactive, because DQ is done in silos and DQ engineers do not understand the data life-cycle. Secondly, in today world, almost all the data is shared. There are multiple touch points for data that can make it corrupt. In some cases, data owners and steward changes along with data life cycle, which makes it so much difficult to manage the transient data. So integrated DQ is needed, which lives along data life cycle and makes it definitive. Organizations operate into motile time zones; various geographies. They have multiple vendors and deal with multiple currencies. Localization, globalization, change of format of incoming data can also make DQ validations fail. Organizations have been suffering from low confidence about data. Though there are some tools available in market like Dataflux from SAS, First Logic, Open Source Data Profiler and others, they are not integrated along data life-cycle. They clean data in parts and a big part of data does not come into tools’ preview. DQ started with address-correction and removing duplicate records of customers from Master Data or Reference Data. It saved organizations money by not sending duplicate emails, promotional offers, or returned postal mails. World has changed now. Today data is exploding; business rules are changing and are getting more complex and data is getting shared across (like social, web2.0 data) domains and organizations. Now DQ has to become ubiquitous. It is required in all domains and all verticals. Today, if a business rules changes, someone has to tell DQ engineers to write new validations. If data is coming from a new source, DQ engineers need to be told about format and business rules. Only structural DQ is of no good. It will not increase confidence about data. Let’s take example of ‘netflow’ data that collects incoming and outgoing bytes from interface devices. The netflow data collected from networking machines are structurally good. (No null, no bad data). If interface-machine or machine-property mapping has been changed in OpsDB (reference database), netflow data is no good for reporting or analysis. So, only structural DQ is not enough. Independently both data (netflow and opsDB) are good but together they are incompatible. Let’s take another example. Once data is archived, format of data changes because of storage optimization. So if you run DQ on archived data or on the raw retrieved data, (before processing into older format) DQ will fail. As mentioned earlier in today’s world, data is sharable and has so many touch points. Sometimes, during data processing, for ease of use or to integrate data with other systems, developers change the data format. Dirty data is injected into the good data. Any integration point, routine, functions or procedures, third party software or user can potentially corrupt the data. So, to have a successful DQ implementation, one should understand the data life-cycle and what kind of Quality validation needs to be done in each phase of life-cycle. Like TOGAF, this paper tries to propose a model for data life-cycle. Each life-cycle phase defines the input artifacts (documents that required for entering this phase) for the phase, the output artifacts (documents that will be produced in this phase – exit criterion) of the phase, steps (processed toke input and create output) to be implemented during the phase and DQ checks to be validated inside the phase. 3.) Data Validation & Formatting Phase. 4.) Data Movement & Sharing Phase. 5.) Data Modeling & Storage Phase. Input Artifacts: The input artifacts to this phase would be Business requirement document, Data source contacts, Data retention policy and Class diagram. Data Quality Implementation: Semantic validation (calling one entity by one name, one acronym for one set of words), Validating naming conventions. Example: In Infrastructure engineering team, ‘node’, ‘host’ and ‘machines’ words are used as inter-exchangeable. Some Data Source captures this information in host table while other keeps information in node table. Semantic DQ validation will iron out these discrepancies and make data less confusing. Output Artifacts: Mapping of entity attributes, List of attributes to be captured and discarded, List of temporal and persistent attributes, Listing of origin of entities, attributes and transactions. Example: Some projects in infrastructure engineering team keep a local copy of relevant entities from opsDB. They synch every day. But if there is frequent update in opsDB for some reason, these projects will be out of synch and data process results will be prone to error. Output Artifacts: Listing of valid state of transactions, Input format, Output format, Data Type, Attribute Ranges. Example: With new set of IP addresses coming, old IP validation will start failing. New set of IP addresses define their format and range. New set of DQ rules should be written to validate new IP addresses. Output Artifacts: Domain (Boundary) of Data, Holes in boundaries, List of shared attributes, Listing of slow changing attributes, Data migration plan, Data flow diagram(DFD), Data security implementation guide. Steps to be performed: Finding of entities and their attributes shared across business domains, Find transactions running across domains, Merging and Aggregation of attributes, Migrating entities into central repository. Example: Typically, for any provisioning data, ‘Ticket_Id’ data type is modeled as Numeric. It helps in storage and indexing. But the Siebel ticket is alphanumeric. Join of any numeric Ticket_Id type to Siebel Ticket_Id will be error. Data Quality Implementation: Validating structural data quality like null validation, de-duplication, data and time format, geo-encoding, primary key-foreign key rule and data massaging. Validate data aggregation business rule like sum, average, count, min and max. Validation conditional business rules like if vendor is ‘x’ model value should be ‘model000, model101, model111 or model123’. Example: For Gomez Bing latency reporting, we implement a set a structural data quality rules – like Null validation, Range validation and De-duplication for primary key identification. Since the input data from third-party (Gomez) and structured, any structural DQ rejection will mean serious business problem. We reject the complete set of data if any of data quality validation fails and notify the input data owner. Steps to be performed: Tagging of data by date, machine and property, Implementation of rules and security of data retrieval, Defining storage format. Data Quality Implementation: Validation of checksum for complete data retrieval, Tag validation for getting the right set of data, Input and Output format validation. Example: We take frequent dump of Microstrategy Reporting server’s repository for archival. To check DQ of archival data, we restore the archived data at frequent interval as a process. Only after successful retrieval, archival data is tagged. Input Artifacts: Data storage information, Entities and attributes that needs to be retrieved, Business rule definition, Mapping of business data – raw data. Example: When we fetch system data having date and time information, we get data from different time zones. We convert all of them to Universal time zone, before doing any meaningful time processing. Example: Multiple Locales have different week starting date, week ending data, and week to month mapping i.e. some projects consider Sunday as week starting date while other consider Monday as week starting date. Some project considers 5 days / week while other considers 7 day /week. Non standardization of calendar date may affect metrics which calculate ‘Average’. So we have implemented a global calendar for AMD warehouse reports for standardization. All time related dimensions come from this standard calendar. In Y! Infrastructural Engineering team, we implement DQ in bits and pieces and as and when required basis, but DQ as a process is missing. DQ is not an afterthought. It should be integrated in planning phase itself. Projects do not define or publish their data life cycle so understanding data needs become difficult for data engineers. In my previous organization, we faced the similar problem. Communicating with multiple teams and multiple stakeholders was time consuming. They were working on a part of data or on transient data but the integrated approach was missing. Then we embarked upon a conceptual project to define the semantic layer and DQ needs. The project created a collaborative interactive platform (twiki based) where data entities were created and, life cycle was described along with DQ requirement, in plain English. Enterprise data architect was owner of the twiki. It was a simple twiki where data architect had broadly followed the above data life-cycle model. He has defined the top level data entities that will be required during the project and their life cycle. He also had defined the possible touch points (based on Data Flow Diagram) and business rules for each phase. Data owners and DQ for each touch points were also listed. Data format, volumetric information, border lines (where data changes) were also mentioned. Each data life cycle phase was mentioned along with Input Artifacts, Output Artifacts, Steps to be performed and Data Quality Implementation. Multiple projects have to consult through this collaborative twiki and they have to follow the data life cycle. Any issue or non compliance was discussed with enterprise data architect. It was a successful exercise. It helped the team tremendously to reduce the time, required to talk to business/customer to understand DQ need. Any new business rule or changed business rules were captured in a twiki before hand and required changes were done before the data became dirty. It shortened the cycle for turn-out and also increased confidence in data. Data audit team found around 90% improvement in the quality of data. Some minor issues were found which were more human than process oriented. This was accepted as best practice. All news projects had to define their data life cycle and broadcast it on collaborative twiki. Any changes in business rules or data quality also would be captured there. A data modeling team was formed which looked into all the issues and non compliance. It was approving body for any change in twiki. If we follow data life cycle and DQ as process or guideline, it will help us tremendously. It is not very difficult to define the structure of the data life-cycle in machine readable format like XML or JSON (See Appendix A – a sample host entity). Though it is not in the scope of this paper, we tried to define the data life cycle through Data Reference Model (DRM) and XML. We were able to capture most of the DQ information and validations, discussed in this paper. If we create a common updatable repository of the related data entities, this model can be extended to data governance framework where business and technology can define, redefine, share and implement business rules collaboratively, in proactive mode rather than wait for business to tell engineering what to do. This paper proposes a model that will help an organization to build their DQ holistically along the data life-cycle understanding. It gives DQ engineering gives bigger perspective about data and expectation from DQ. 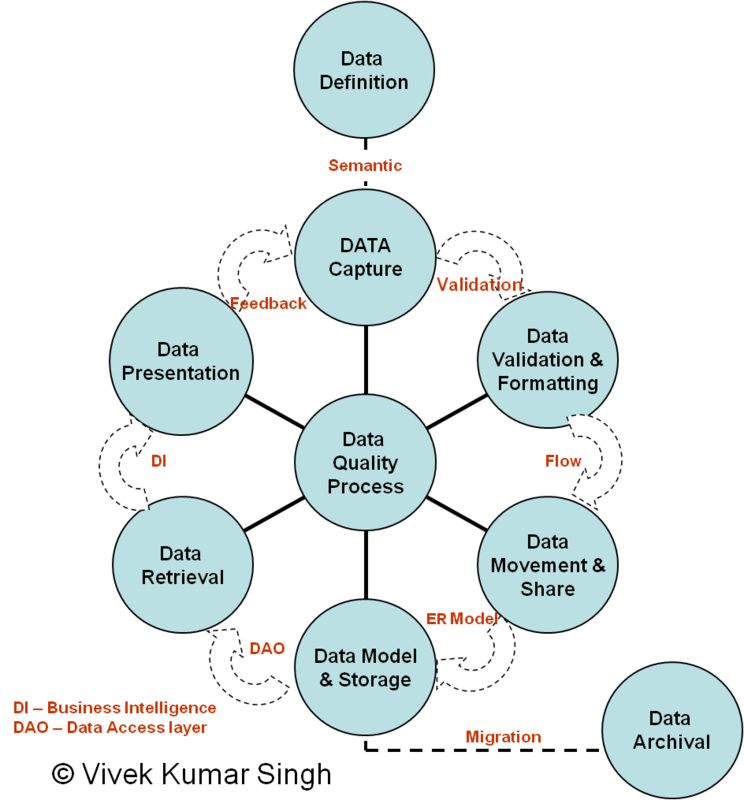 If we follow the data life cycle, understanding about data increases and that leads to better data quality management and confidence about data. If the process is optimized, DQ becomes a proactive process rather a reactive process. If we can mention the future need of business or possible forms and format of data; DQ engineers will proactively implement the DQ validations and alert that will save organizations from reactive developments. It is possible that some projects have unique DQ requirement or they may not follow the above 8 steps of data life cycle. This model is an attempt to provide a framework, a best practice guideline rather than a stringent, must-follow process. <!– Purpose – This XML will work as template for creating XML to represent entities. Root element will be name of entity. Default namespace will be the domain in which entity will fall. Use third party reference domain elements wherever possible using the namespace. <!– Classification element will have metadata that will classify the entity representation. It will not have information related to entity instances. instances is physically stored. Storage Type can be – File System, RDBMS, or MainFrame. Identifier can be filename or RDBMS name. If it stored in Database, it is good practice to add fieldname as an attribute element to establish reverse traceability.